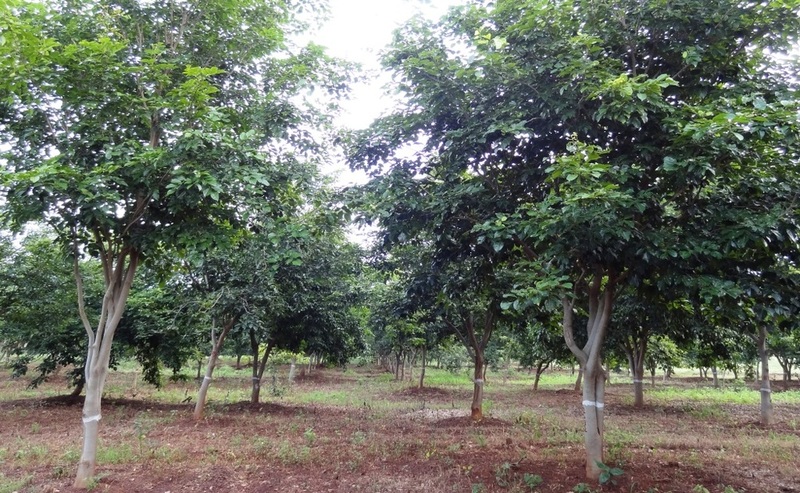 High yielding, early to mature, robust to drought and nitrogen fixing plus Pongamia pinnata are the most promising non-edible, non-food oilseed tree for the seasonally dry tropics. plus Pongamia are propagated from mature Mother Trees, like the one above. A careful process of multi-annual verification has been conducted to guarantee >50kg seed (@35% oil content) is produced annually. The Mother Trees are not irrigated or fertilised. They require zero inputs to produce these yields. By virtue of the propagation process young plus Pongamia produce flowers and pods almost immediately. The sapling above is only one year old. If the flowers were left on the tree it would produce pods. However, for improved intensive branching and vegetative growth the saplings will be pruned and flowers removed until 3 years old. By varying the spacing between trees a very wide range of intercrops can be grown, for food, fibre and oil. 7 Year old pongamia at the toil farm. livestock can graze beneath the trees. The ability to intercrop means 2 things.